I had the pleasure of sharing this experience with UICB instructor and friend Emily Martin, who braved the journey (and shared in driving) through severe winter storms both to and from Penland with me. We managed to get up the mountain and settle in before the worst of it hit, but it took the better part of two days for the remainder of our group to arrive. Most of our group on the first day of the residency. The polar vortex managed to make its way all the way down to North Carolina. It was -6 the morning of this photo. The pipes had frozen causing the building to lose heat, but that didn’t keep our ever-intrepid group from getting to work in full winter wear. Photo credit: Emily Martin. I focused my residency on producing a tunnel book about US/Canada border relations, specifically the 20-foot swath of clearcut forest that divides the North Cascades between Washington State and British Columbia. This topic, which will also form the basis for my thesis this coming year, examines the politics of international boundaries and their effects upon the natural environments they inhabit. Unfortunately, this clearcut is not limited to the Cascades region, but stretches over mountains, through forests, reserves, and grasslands for the entirety of the 5,525 mile long boundary that separates these two nations. Moreover, it is expected to be kept clear in perpetuity, which requires scheduled maintenance every three years to prevent this long stretch of land from covering its scar. In my research I have come across a number of images of the felled borderline, but none so palpable as the image above. It is an authentic, historical piece of documentary evidence of the first clearing of the border through the North Cascades in 1860. It formed the basis for this book. Film ink on Yupo painting. I began by roughly sketching the forest into five separate panels that together would create the perspective of a stretch of land fading into the distance. I then filled in the detail of the forest panels by painting with film ink on Yupo. Cleaning the image in Photoshop. Next, I scanned my paintings and cleaned them up in Photoshop so that they could be inverted and made into negatives. I then made polymer plates from the negatives and letterpress printed them. Letterpress printed panels in the process of being cut by hand. After all the panels were printed, I began to cut them by hand and layer them to test the accuracy of their perspective and assemble a structural mock-up. At this point, Emily suggested probably one of the most helpful structural tips I have received, which I would feel amiss not to pass along. She suggested I set the registration points I would use to mark my folds as hairlines in In-Design. I could then use this file to create a polymer plate to emboss the fold lines for the tunnel into my paper. This would ensure accurate registration of folds across the edition without any pesky measuring. Genius!!! Folded accordion support for the tunnel. Here is the tunnel put together! I still have a long way to go. Next up is figuring out the specifics of the enclosure and details like titling, descriptive information, and colophon. I couldn’t be happier with the amount I was able to get done in two weeks. It was such a pleasure to wake up every morning and get to focus on a single project. 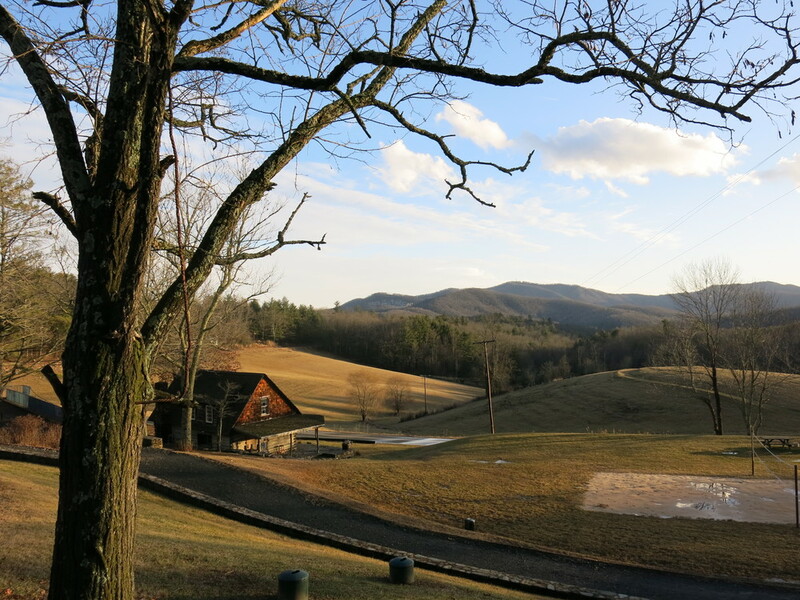 Not to mention I got to look out the window at the beautiful Blue Ridge Mountains as I worked! What could be better, really? 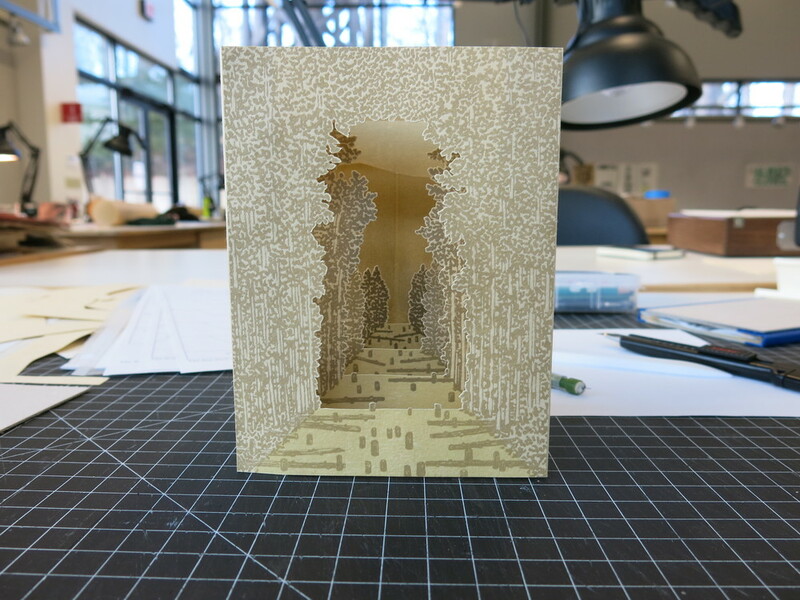 Special thanks to the Penland School of Crafts for offering me this fantastic experience, and to Kathy Kuehn (our lead printer) for providing her invaluable guidance along the way.